The condo market in Miami is flourishing, the projections for new condo units being built has skyrocketed with 1,825 units expected to be completed in 2015 compared to the 33 units completed in 2013. As with anything, this means that the prices are increasing. It is estimated that units currently under construction cost about $500 a square foot, but projects that haven’t started yet, are averaging $600-$650 a square foot. This is especially true for sites on the waterfront because the spaces are all filling up. Most of these projects are luxury condo towers rather than office spaces or lower cost condos. An important piece of this rise in the condo market is real estate developer Ugo Colombo. Most recently, Ugo Colombo is in the process of proposing the building of a second Brickell tower on Brickell Ave, very close to another one of his projects, the Brickell Flatiron. This second Brickell tower is expected to be extremely luxurious as with all the other buildings Mr. Colombo has undertaken. The Brickell Flatiron will have over 500 condo units at 700 feet tall. Some other projects that Mr. Colombo has developed are the Grovenor House in the Coconut Grove community in Miami as well as Bristol Tower and the Santa Maria on Brickell Avenue. It will be interesting to see what comes of the second Brickell tower. 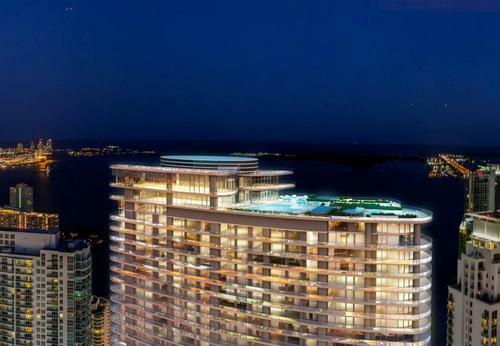 Shown above is a rendering of the Brickell Flatiron rooftop. This entry was posted in News and tagged brickell flatiron miami, CMC Group, Ugo Colombo, ugo colombo brickell flatiron, ugo colombo cmc group, Ugo Colombo The Collection on December 12, 2014 by Ugo Colombo.